In the Gas Exchange unit we will learn that the purpose of the respiratory system is to perform gas exchange. Pulmonary ventilation provides air to the alveoli for this gas exchange process. 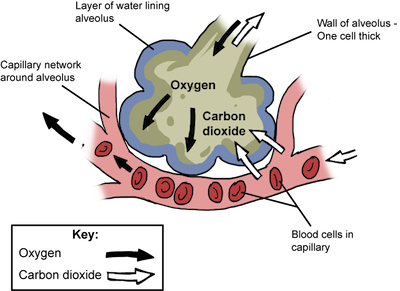 At the respiratory membrane, where the alveolar and capillary walls meet, gases move across the membranes, with oxygen entering the bloodstream and carbon dioxide exiting. It is through this mechanism that blood is oxygenated and carbon dioxide, the waste product of cellular respiration, is removed from the body. 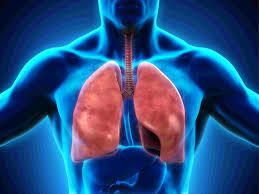 ​The lungs are actively ventilated to ensure that gas exchange can occur passively. Outline how epidemiological studies contributed to understanding the association between smoking and lung cancer. 6.4.U1 Ventilation maintains concentration gradients of oxygen and carbon dioxide between air in alveoli and blood flowing in adjacent capillaries. Small single celled organisms can easily diffuse gas in and out of the cell as long as they are in an environment where concentration gradients exist for passive diffusion. For example, O2 in water can diffuse into a protist as long as the concentration of oxygen in the surrounding water is greater than the oxygen levels inside the protist cell. Human bodies are surrounded and protected by layers of skin. Thecells in the tissue that need oxygen for respiration are too far away, too protected, and too numerous to allow direct diffusion with their environment. Humans need a system to keep a fresh supply of O2 and to get rid of excess CO2. The oxygen is then transported to all the tissues in the body. The CO2 in the tissues is transported by the blood to the lungs, where it diffuses into the alveoli and is exhaled into the surrounding atmosphere. 6.4.U2 ​Type I pneumocytes are extremely thin alveolar cells that are adapted to carry out gas exchange. ​Alveoli function as the site of gas exchange, and hence have specialised structural features to help fulfil this role. Amitotic and unable to replicate, however type II cells can differentiate into type I cells if required. 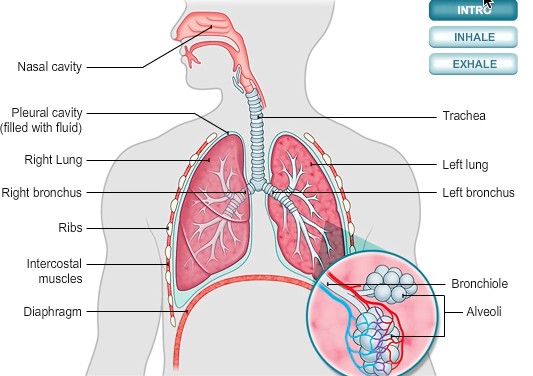 6.4.U5 ​Air is carried to the lungs in the trachea and bronchi and then to the alveoli in bronchioles. 6.4.U6 ​Muscle contractions cause the pressure changes inside the thorax that force air in and out of the lungs to ventilate them. 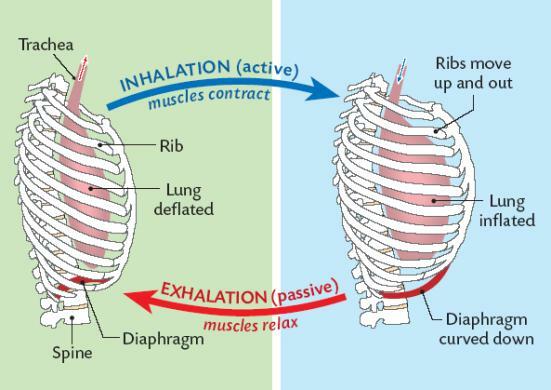 Breathing is the active movement of respiratory muscles that enables the passage of air into and out of the lungs. 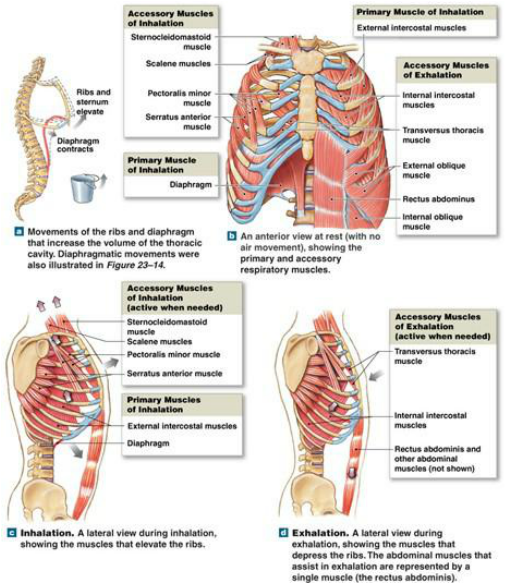 The contraction of respiratory muscles changes the volume of the thoracic cavity (i.e. the chest). 6.4.U7 ​Different muscles are required for inspiration and expiration because muscles only do work when they contract. For example, when one breaths in air, the external intercostal muscles contract, moving the ribcage up and out and the internal intercostal muscles relax (biceps and triceps work in similar fashion in our arms). The opposite occurs during expiration. 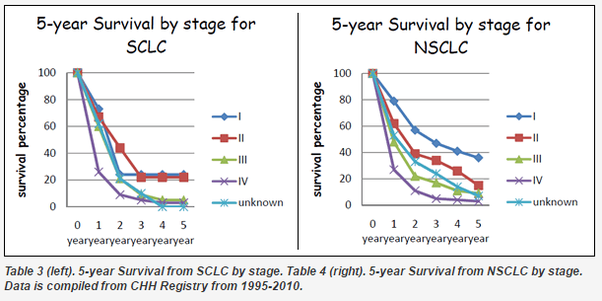 6.4.A1 ​Causes and consequences of lung cancer. Air pollution from exhaust fumes containing nitrogen oxides, fumes from diesel engines and smoke from burning carbon compounds such as coal are a minor cause of lung cancer. This depends on where in the world you live and the air quality. Construction sites, factories and mines can have dust particles in the air. If steps aren’t taken to properly protect the worker's, lung cancers can develop. Lung cancer is a very serious disease and the consequences can be severe, especially if the cancer is not recognized early on. If the tumour is large when it is discovered, metastasis might have occurred (cancer spreads to other parts of the body and forms secondary tumours). In these cases, mortality rates are very high. If the tumour is found early on, parts of the affected lung with the tumour can be removed and chemotherapy can be used to help kill the rest of the cancer cells. Re-occurrence of the disease is quite common. 6.4.A2 ​Causes and consequences of emphysema. (Oxford Biology Course Companion page 316). List symptoms of lung cancer. The alveoli can merge forming huge air spaces and a lower surface area. 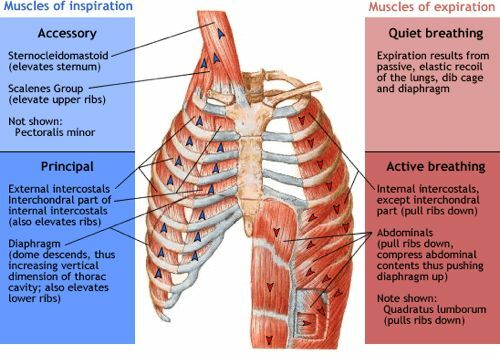 6.4.A3 ​External and internal intercostal muscles, and diaphragm and abdominal muscles as examples of antagonistic muscle action. External intercostal muscles contract pulling the ribs upwards and outwards. The diaphragm which is a flat sheet of muscle extending across the bottom of the rib cage contracts and flattens out. These two actions enlarge the thoracic cavity surrounded the lungs, thereby increasing the volume of the lungs. When the volume of the lungs increases, the pressure inside the lungs decreases and becomes lower than the pressure in the surrounding atmosphere. Since gas moves from higher pressure to lower pressure, air rushes into the lungs from the surrounding atmosphere to equalize the pressure. The external intercostal muscles relax and the diaphragm snaps back to its original shape (domed shape). This moves the ribs back down and inwards and decreases the volume of the thoracic cavity and the lungs. This decrease in volume increases the pressure inside the lungs. Since the pressure inside the lungs is now greater than the atmospheric pressure, and gas moves from high pressure to low pressure, air rushes out of the lungs into the surrounding environment. So we all know that breathing is pretty important, right? Today we're going to talk about how it works, starting with the nameless evolutionary ancestor that we inherited this from, and continuing to the mechanics of both simple diffusion and bulk flow, as well as the physiology of breathing, and finishing with the anatomy of both the conducting zone and the respiratory zone of your respiratory system.